Central Florida Immigration attorney > Testimonials > Extremely knowledgeable, thorough and resolute. 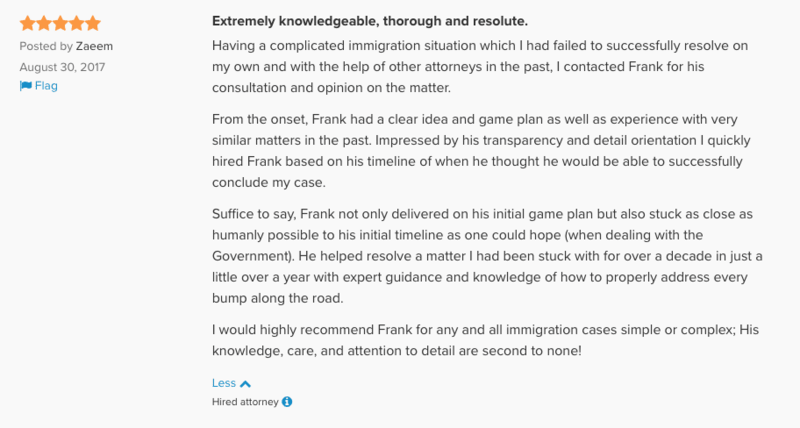 Having a complicated immigration situation which I had failed to successfully resolve on my own and with the help of other attorneys in the past, I contacted Frank for his consultation and opinion on the matter. From the onset, Frank had a clear idea and game plan as well as experience with very similar matters in the past. Impressed by his transparency and detail orientation I quickly hired Frank based on his timeline of when he thought he would be able to successfully conclude my case. Suffice to say, Frank not only delivered on his initial game plan but also stuck as close as humanly possible to his initial timeline as one could hope (when dealing with the Government). He helped resolve a matter I had been stuck with for over a decade in just a little over a year with expert guidance and knowledge of how to properly address every bump along the road. I would highly recommend Frank for any and all immigration cases simple or complex; His knowledge, care, and attention to detail are second to none!